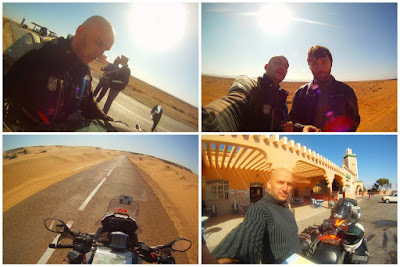 Morocco from Tony Peeters on Vimeo. We are driving every day now, going down the Atlantic Highway that crosses the big sahara desert. This is one of 2 asfalted roads that connect North and South Africa, the other one is in Egypt, and that one is on my itinerary also. I realy don't like this road, but as there is no alternative, every day we make our way a bit further down, down south, to the real Africa, which for me starts as soon as we cross the border to Mali. For the moment we are in Dakhla and Mauritania is only one days drive away, but we decided to spend newyear here, as in Mauritania alcohol is forbidden and any alcohol that is found in your luggage, is immediately confiscated. Tomorrow Charlie should arrive and we can have a little international biker party!